The Olofa of Offa Oba Mufutau Gbadamosi in Offa Kwara State, has spoken on the alleged involvement of the Senate President, Dr. Bukola Saraki in the recent bloody bank robbery in Offa. Gbadamosi, who admitted in an interview with Punch that politicians sponsor thugs, however, said the Senate President may not have sent anyone to go to rob and kill people. He said, “Do you expect somebody like Bukola to ask someone to carry a gun and kill the people he is ruling or steal their wealth? “He has been giving us; we do not expect that he would go and rob Offa or ask some people to go and rob us. What will he gain from that? Speaking on some of the arrested suspects who were seen at the wedding of Saraki ’s daughter, the monarch added, “You can see them at (social) venues. It is just like you sending someone with your car to go and get something from the market and he decides to use the car for another thing. Would that mean that you are the one that sent him to go and do that? “If I give you my car to pick a friend from Ilorin, and on your way, you decide to branch to Omu–Aran to go and do another thing, does that mean I am the one that sent you to Omu -Aran? That is it! “If it is a question of thugs, all the politicians have thugs. You would not know what they are doing. I listened to the confessions of the suspected robbers. They never said he (Saraki) sent them to go and rob. “They said they were his political thugs and that he was not aware of their robbery (operations). 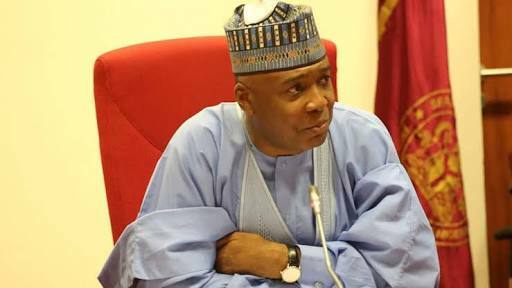 “Some people argue that Saraki, by empowering them and giving them vehicles, emboldened them to commit crimes and they felt protected or shielded by the number three citizen of Nigeria. “He gave vehicles to a lot of people. He gave many people all over the country. Many people received vehicles from him. “Even in Offa, anytime politicians are doing their empowerment programme, they give out cars, motorcycles and other items to people.